Expiry: The program lasts for one week and you must use the code by September 11. Step 2: Select the button for "Yes, I have a promotion code." Step 5: Come to MAX and party with us!!! Don't forget to come to the special MAX bash and see the band 22nd Century play live! This is an application based on the James Ward and Bruce Eckel book "First Steps in Flex". 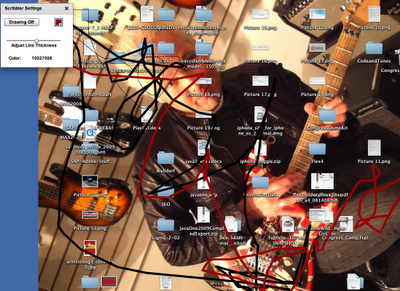 The tutorial shows you how to build a simple program to scribble all over your screen as shown in the graphic below. This is done by using the flash.events.MouseEvent class to track mouse movements and then feeding coordinates to the graphics package and invoking the lineTo(event.localX, event.localY) method. I never realized the irony until now that I had scribbled over the nice lines Eddie Van Halen had hand painted onto his EVH Frankenstein (the guitar I am playing in the photo below). This was by far one of the best guitars I have ever played in my life. If you want the full source code for this, please email me dnickull at adobe dot com. The First new Flex 4 book!!! 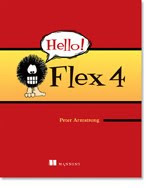 Peter Armstrong, Flex expert and author of Flexible Rails, is working on a simple Flex 4 beginner book: Hello! Flex 4 <http://www.manning.com/armstrong3> . It's a intro manual to get up and running on Flex 4 without getting bogged down in too much technical detail. Along the way, Peter walks the reader through building their own Flex app called SocialStalkr, which is a mashup of Yahoo! Maps and Twitter. The book is currently in the Manning Early Access Program <http://manning.com/about/meap.html> , which enables readers to get the book as it's being written. If you or someone you know is eager to get started with Flex, this would be the perfect primer to pick up. With Flex 4 you can easily add color and life to your web applications by introducing dynamic user features, slick transitions, and eye-catching animations. Flex also provides powerful data handling capabilities so you can build industrial-strength applications. And it's open source, so you can get started without forking over a lot of your hard-earned cash. We think it should be just as much fun to learn Flex as it is to use Flex. Hello! Flex 4 shows you everything you need to know to get started with Flex 4 without bogging you down in obscure detail or academic edge cases. In this entertaining, hands-on book, you'll quickly move from Hello World into the techniques you'll need to use Flex effectively. You'll start by progressing through 26 self-contained workshop items, which include everything from small one-page examples, to a 3D rotating haiku, to building a Connect Four game. Finally, in the last chapter you'll build a full Flex application called 'SocialStalkr': an interesting mashup of Twitter and Yahoo Maps that lets you 'stalk' your friends by showing specially formatted Twitter tweets on a Yahoo map. Whether you're a weekend developer or you have great plans for Flex, Hello! Flex 4 is a great place to start.